Photos of Aice Jackman, who was killed in 2017, were carried in the Mother’s Day Walk for Peace. 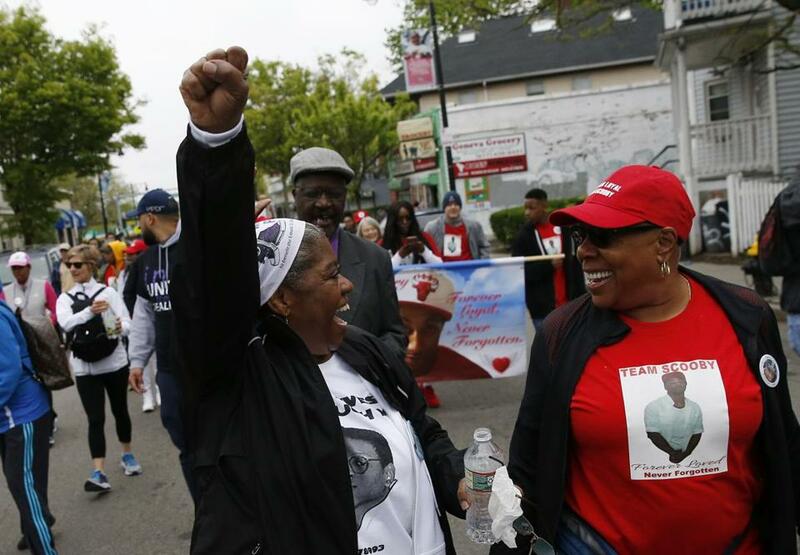 As hundreds of marchers began the annual 7-mile Mother’s Day walk early Sunday morning in support of families who have lost loved ones to street violence, Raeshaunna Armstrong lingered near the starting point. The mother of 23-year-old Christopher Joyce endured much in the past week. Armstrong’s son was shot and killed, along with family friend Clayborn Blair, 58, on May 4 outside the Mildred Hailey Apartments in Jamaica Plain, just minutes after leaving her home, according to a family member. Since that Friday night, Armstrong has been planning a funeral when she would have been preparing for her son’s graduation celebration. Joyce was set to become the first in his family to graduate from college next weekend, when he was to receive his diploma from Salem State University. On Saturday, police arrested Wilvin Guity, 28, of Dorchester, in connection with the deaths of Joyce and Blair. Guity is scheduled to be arraigned Monday, days before Armstrong’s son is remembered at a funeral on Wednesday. “It was a really hard decision to come today,” said Armstrong, encircled by family members, as she joined in at the tail end of the march. 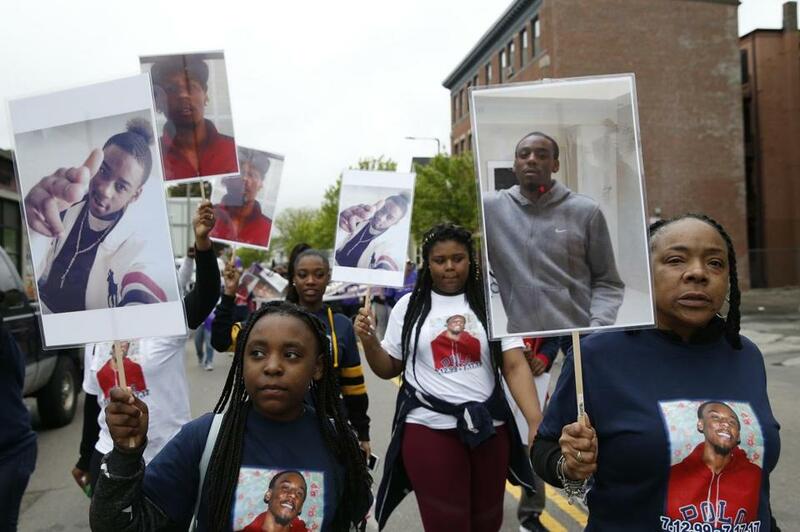 Hundreds walked from Dorchester to City Hall Sunday morning as part of the annual Mother’s Day Walk for Peace, carrying posters with photos of victims to honor those lost to street violence. Tina Chery (left), founder and president of the Louis D. Brown Peace Institute, raised her hand as she chanted for peace. 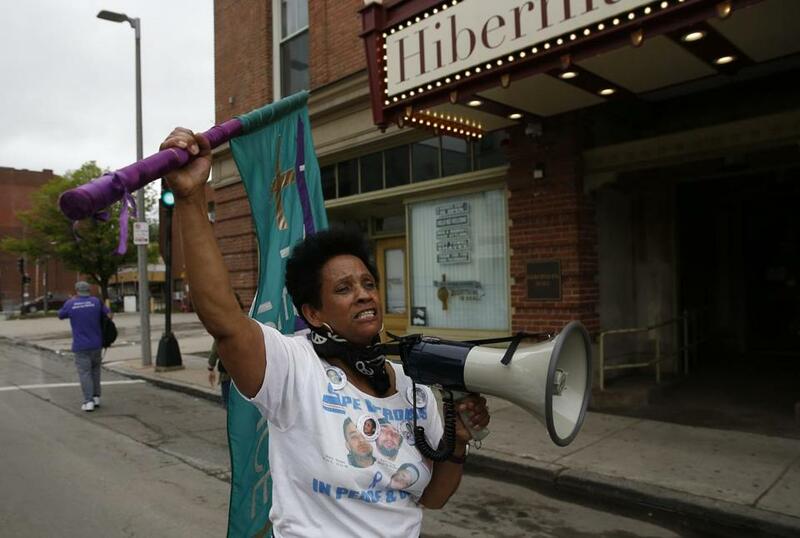 Lead organizer Tina Chery welcomed the crowd but said she hoped someday they wouldn’t need to gather anymore. In 1993, Chery’s 15-year-old son was killed in the cross fire of a gang shootout on his way to attend a Teens Against Gang Violence meeting. The following year, Chery founded the institute, named after her son, to offer assistance to families and communities who have suffered similar violence. Chery also celebrated the recent passage of a criminal justice reform bill, which included amends to the state’s Victims of Violent Crime Compensation statute to ensure that family members of murder victims cannot be denied reimbursement for funeral and burial costs. The bill was signed by Governor Charlie Baker on April 13. Women stood in a window and blew kisses to marchers. Elisha Ross, whose 34-year-old son was killed March 30 in Dorchester, also spoke, thanking Chery and the institute for their support since the fatal shooting. “My son, Michael Ross, knew that his life would end in the streets,” she said. Ross was shot and killed on Good Friday morning in Dorchester. No arrests have been made in the case, according to police. “I’m walking with the hope that one day no mother, father, or family will have to suffer the loss of a child,” she said. Debra Morris-Covington, who first participated in the walk in 2016, said the event has helped her connect with others who understand the emotional stages people suffer with the loss of a family member. Her 3-year-old grandson, Kenai Whyte, was killed in January 2016. The child’s stepmother, Marie Buie, was charged with his death and faces trial in July. When former Patriots player Aaron Hernandez killed himself after he was convicted for the 2013 murder of Lloyd, Ward felt she lost an opportunity to see justice for her son. Now, she feels that being happy is best way to honor him. 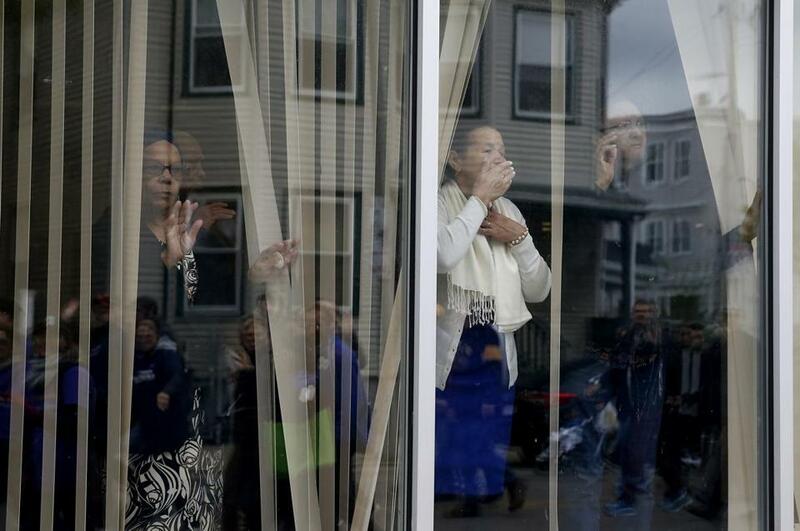 Isaura Mendes of Dorchester, who has lost two sons to street violence, participated in the march.